With this unique look can say it is part of the environment, the viewer sees only a distortion specific mirroring, the feeling is a need for transparency, in a word is a creation stunning in contemporary design. The outdoor studio by Amsterdam-based architects Architecture DHL is a futuristic real inspiration. 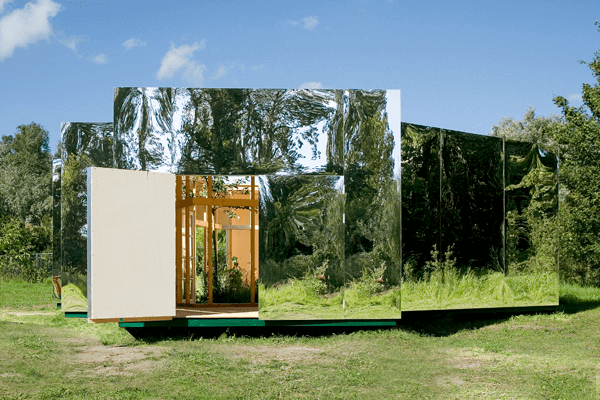 The look of the outdoor pavilion design with mirrors give easily transition from the inside out and vice verso. Hello.This article was really motivating, particularly since I was looking for thoughts on this topic last Wednesday. Howdy very nice web site!! Guy .. Excellent .. Superb .. I will bookmark your website and take the feeds also?KI’m glad to search out numerous useful information right here in the put up, we want develop more strategies on this regard, thank you for sharing. . . . . . This is the proper weblog for anybody who wants to find out about this topic. You understand a lot its nearly onerous to argue with you (not that I truly would need…HaHa). You positively put a brand new spin on a subject thats been written about for years. Great stuff, just nice! Throughout the great scheme of things you actually receive a B- just for effort. Where you lost me personally ended up being on all the particulars. You know, people say, details make or break the argument.. And that could not be more correct right here. Having said that, permit me tell you what exactly did do the job. The authoring is certainly really powerful which is probably why I am making the effort to comment. I do not make it a regular habit of doing that. 2nd, despite the fact that I can easily see a leaps in reasoning you come up with, I am not convinced of how you appear to unite the ideas that make your conclusion. For the moment I will, no doubt subscribe to your point however trust in the foreseeable future you actually connect your facts better. I really loved this website. Thank you.